Brooke and Kathryn used to be best friends, but now they're bitter rivals. Brooke is the all-powerful queen bee from a well-to-do family, while Kathryn is the studious, hard-working wallflower from a more blue collar family. Both girls are star singers in the honors choir at their high school and often compete against each other for parts. But soon they will be competing against each other for something even bigger: a $25,000 prize at the prestigious Blackmore vocal competition. This novel is told in first-person point-of-view, alternating between Brooke and Kathryn. We start off the narrative during their senior year, with these two ladies already hating each other. The reader is left to puzzle the pieces together to figure out why they hate each other so intensely. While the novel ping-pongs back and forth between Brooke and Katrhyn as narrators, it also sections back and forth between junior and senior year so we can start to see the unraveling of their friendship and how they came to the point of contention. I especially loved that each section was met with a musical term that related to what was going to happen in that section such as dissonance, capriccioso, crescendo, etc. I thought that was a wonderful way to foreshadow for the reader what was coming up. 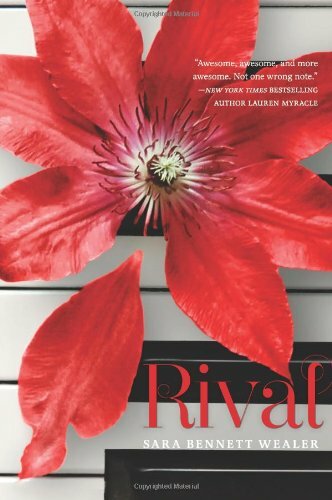 I thought Rival was a perfectly addicting debut novel with just the right amount of character development and plot excitement. I also enjoyed the "protagonist is also antagonist" approach Wealer took with the plot. As I continued to read, my opinion of each girl changed depending on who narrated. I couldn't decide whose side I was on more: Brooke's or Kathryn's, which I'm sure is exactly how Wealer designed the novel. I loved that the prose read with such ease and facility, and kept you turning page and after page, convincing yourself, "Just one more chapter, then I'll go wash the dishes." This was especially true as you get to the part of the book where you finally figure out why Brooke hates Kathryn so intensely. Lovers of classical music/opera will devour this book, along with those who eat up stories of catty girls. Though, I have to warn you, this book delves much deeper into the cattiness than just your normal fluff read.While this is Sara Bennett Wealer's first novel, I certainly hope it will not be her last! Cover Comments: I like the striking red flower in the foreground with the piano keys behind it, but I almost wish the piano were a more prominent part of the cover. You almost have to be looking for the piano keys to know that's what they are - or be like me who played the piano for 13 years and can spot piano keys from a mile away.